Despite having a happening nightclub outside our hotel room in Melbourne, we slept fairly soundly. We woke up with the morning light just before 07:00 (after the adjustment for the beginning of daylight saving). Michelle had a shower while I finished of last night's diary entry. We packed our bags, then left to get breakfast at a cafe we'd spotted last night. Michelle had liked the look of it, and I asked if they were open for breakfast. The woman assured me she would be there from 08:30. We arrived at the cafe a few minutes early, so took a walk up Little Collins St towards Swanston St to chew up some time. By the time we returned it was a little after 08:30. Although there was someone in the cafe, it wasn't open yet. We poked our noses down Block Lane immediately opposite and saw several cafes in there open. We gave the original plan a few more minutes in case they opened. While we were waiting, we saw a photographer in the street taking pictures down one of the tiny alleyways. It turned out he was taking shots of a family group of parents and two kids, about 7 years old. The parents were trying to coax the kids into standing in front of various grimy urban walls while the photographer snapped them. Eventually the kids got upset and refused to cooperate, whereupon the parents picked them up and posed in front of some graffiti for the photographer. After a few minutes of watching them, we gave up on our original cafe plan and went to Caffé Cortilé in Block Lane instead. I ordered an Eggs Atlantic, consisting of two poached eggs on muffin halves, with smoked salmon and hollandaise sauce. Michelle wanted the Spicy Fruit Toast with Condiments, but also the Muesli with Yoghurt and Fruit Compote, so we ordered both and decided to share them. It was all good, and nicely filling for our first day on the road. We walked back to the hotel and checked out, leaving our bags in their care while we walked over to Elizabeth St and then north to Franklin St, where we picked up our hire car. After checking it for dings and scrapes, we took the keys and took our first tentative driving steps in this strange city. Thankfully navigating back to the hotel was straightforward. I even got to make a hook turn, which was cool. We loaded up the car, placing major luggage in the boot and putting various things like maps, guide books, cameras, hats, and other stuff we would need frequently on the road onto the back seat. Thus loaded, we hit the road! Navigating out of Melbourne on to the West Gate Freeway was a little hairy, with a few last second lane changes to get the right turns, but we managed it without incident and sped on our way to Geelong. The Melbourne to Geelong freeway is staggering... it was four lanes each way for much of the distance, and five for a while. And dead straight, through featureless plains of golden dry grass dotted with (well okay, features) trees. We passed signs bearing animals like rhinos, lions, and giraffes, indicating the proximity of a zoo I think. A bit further on we passed a big flat open field, which resembled a tiny rural airfield, except for the presence of a whopping great Qantas jet sitting there dwarfing a small plane hangar. Some signs indicated Avalon Airport. Along the drive, Michelle fiddled with the radio. We picked up a slew of stations near Melbourne and Geelong, and settled on a classic hits station for a while. Unfortunately it didn't seem to be tuned in quite right, as it had that distinctive lack of bass that is a signature of such things. Some of the other stations were better, in terms of reception, if not music selection. After half an hour or so we passed through Geelong. The Lonely Planet said that there's little incentive to stop there, and indeed we flew through it, only stopping briefly in the trailing suburbs to avail ourselves of the toilet facilities at a handy Red Rooster. I ate one of the pears we'd purchased yesterday - it was nice and juicy, bit a bit too ripe and soft for my taste. Refreshed, we headed onwards to Torquay and the coast. The first indication of Torquay as you close in from the highway north is a vast complex of surf shops, called Surf City Plaza. 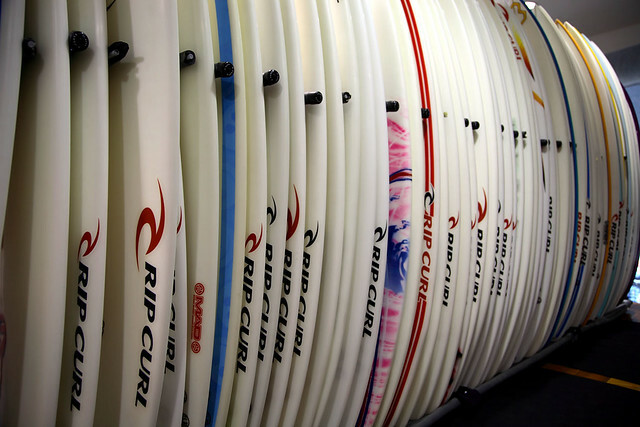 It has giant stores belonging to Rip Curl, Quiksilver, Oakley, Billabong, and other famous surf brands. 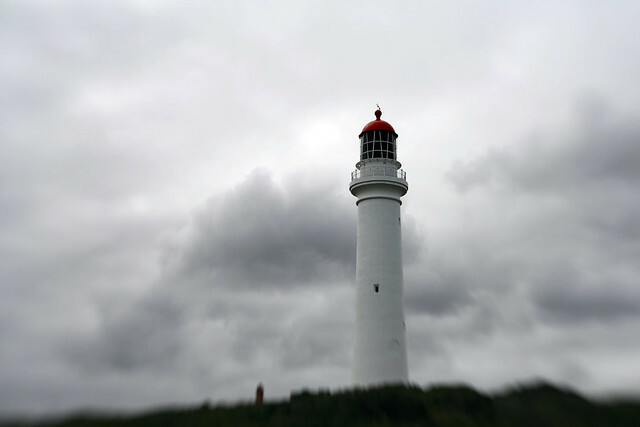 We weren't sure that this amazing apparition was all there was to Torquay, so we continued on and took a promising looking turn and found ourselves amidst a short strip of fish and chips shops, cafes, and other assorted retailers. We parked the car and took a walk to see the sights, of which there were basically none, until we realised there was a beach at the end of the road and walked the extra block there. The beach was quite picturesque, split in the middle by a small rocky headland that we walked on to. It contained a small memorial to the ANZAC troops, after which the point was named. Back from the beach were numerous surfy holiday homes and apartments. Despite the cold, there were several people walking along the beach, and a handful of swimmers in wetsuits braving the water. After admiring the view along the coast in each direction, we walked back to the car and drove back to Surf City Plaza to have a look at this surf shopping mecca. We browsed the shops for a while, then Michelle got a coffee from a cafe and we took to the road again. From Torquay we took a minor road down to the coast and Jan Juc Beach, and then its more famous neighbour, Bells Beach. The surf at Bells looked pretty good to my untrained eye - certainly bigger waves than I've seen in Sydney except on very rare occasions. There were about two dozen wetsuited surfers out there, battling against the six- to eight-foot swell as they paddled out on the far left side of a rocky point, then queued up to catch the waves incoming closer to the point. We saw some good rides, but more than a few wipeouts. As we were there admiring the action, a man and woman approached the lookout point we were occupying. She said in a disappointed voice to him, "Oh, the surf isn't very good today, that's a shame. You should see it when the surf is better." 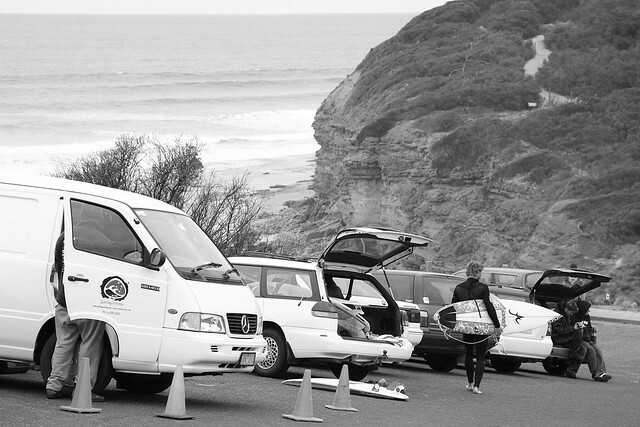 I was rather surprised, but then I guess when this is the world-famous Bells Beach we're talking about, home of one of the most prestigious surfing championship titles in the world (if not the most), eight-foot waves must be fairly modest. As it turned out, I think Bell's was actually just on the right side of the point we were on, and the waves there were a bit smaller than those on the left where the bulk of the surfers were. I walked down the wooden stairs to Bells Beach itself, so I could say that I stood on the sand of the beach. I walked close to the surfline to get a photo of the giant waves crashing on to the beach, and as I approached, a siren sounded from further along the beach. At first I thought I was going to get told off for getting too close to the dangerous surf or something, but no such thing happened, and I crouched there on the sand and took some shots of the walls of water smashing into the sand. I could feel the spray, and I hope my camera didn't catch too bad a dose. Leaving Bells Beach, we drove on to the small town of Anglesea, where we stopped for lunch. The Lonely Planet recommended a certain Riverside Deli by the bridge over the river as a good place to get a sandwich, but when we approached the indicated spot, we saw a cluster of four shops, none of which bore that name. Since our guidebook dates from several years ago, we figured that the Riverside Deli mustn't have been good enough to survive to the present day. The replacements didn't look too promising so we backtracked to the main shopping centre of Anglesea where we located a cafe that served vege burgers (for Michelle). I had a pepperoni pizza and a Cascade lemon and lime soda. After eating, Michelle bought another big bottle of water from a nearby IGA, and we drove on. The road began winding along the coast, and we stopped in a few spots for photos. In the distance we could see the Split Point Lighthouse, indicating the headland near the town of Aireys Inlet. Despite its apparent great distance, we were there pretty quickly, and took the turnoff up Lighthouse Rd to go take a close up look. The parking area at the top of the headland was a short walk from the lighthouse, and there were lots of people there walking back and forth or admiring the lighthouse. We saw some people up on the catwalk around the light at the top, and I was excited that we would get to climb up and see the light close up. But when we arrived, it was to discover that the last guided tour for the day was just finishing, and we couldn't in fact go inside. Nevertheless, we took the short loop walk out to a couple of lookouts on the cliff top, which were nicely scenic. 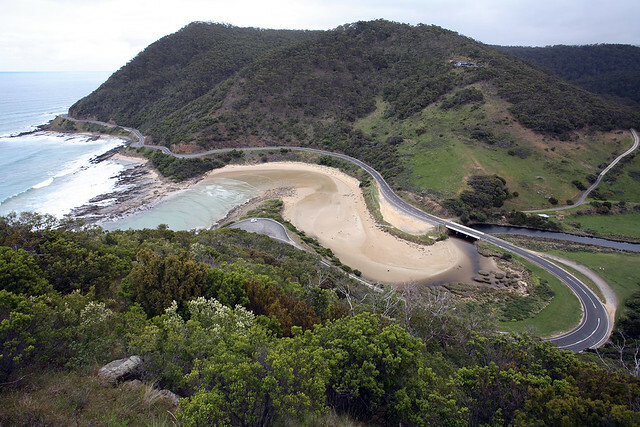 From Aireys Inlet, we continued our journey, heading towards Lorne. 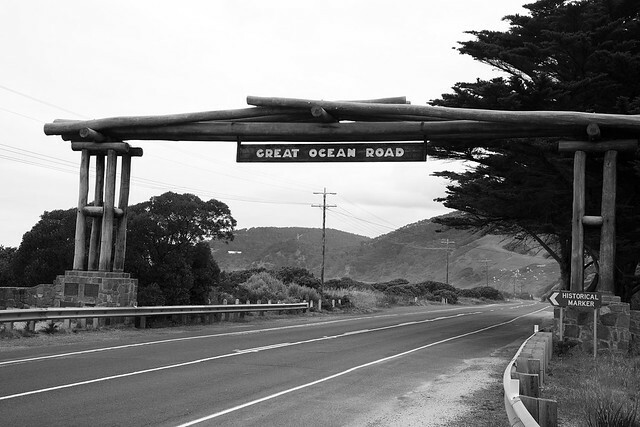 Partway there, we passed the memorial gateway over the road serving as the marker for the beginning of the Great Ocean Road. The road became ever more winding and scenic, wending its way between the crashing surf on the left and crumbly cliffs of red clay and sandstone on the right. Although the posted speed limit was 80, there was little hope of getting up over about 50 km/h on most of the road, and there were several much slower winding sections and hairpins. The good part is that there are lots of spaces by the right suitable for pulling into, so you can park for a few minutes, stretch the legs, and take in the expansive coastal views. They also serve nicely to let faster cars creeping up behind you overtake. We stopped in Lorne for a toilet break and to look around the very touristy shops littering the main street. there was a bakery there advertising medals in the Great Aussie Meat Pie Competition, but a potential dilemma so soon after lunch was averted by the fact that they appeared to have sold out of pies for the day. They had some sausage rolls left, but as evidenced by Sylvia and Fran's in Collaroy, medal-winning pies are no guarantee of a decent sausage roll. So I avoided eating on a full post-lunch stomach, and we returned to the car for a short drive inland up the hill behind Lorne to Teddy's Lookout. The car park was a good 20 minute's walk from the lookout spot according to a map there, so we prepared to set off along the marked trail through the bush, when there was a rustling in the undergrowth beside the road. Michelle exclaimed and called me over, pointing out a large echidna scrabbling through the brush! I approached with camera ready, and the spiny creature huddled into a defensive posture, with its face planted firmly into the ground. I waited it out silently and eventually it looked up, determined that I was not threat and went about slowly scratching around in the plants in front of it. I was maybe a metre away, and snapped a couple of quick shots before retreating respectfully. We set off on the loop track to Teddy's Lookout, and soon came across a secondary lookout spot, which afforded a fantastic view over the loops and switchbacks of the road west of us. Continuing on, we reached Teddy's Lookout itself, perched precariously high up on the hill, from which the view was even more spectacular. It was only at this point that we discovered another car park, not a minute's walk from the lookout, thus avoiding the necessity for a 20-minute walk down and up the hillside to get there from where we had parked. Nevertheless, the walk had been fun and some good exercise after a day in the car. Twenty minutes walk later we were back in our car and heading down the hill back to the main road through Lorne. As we drove past the rows of houses, we spotted another echidna, this time walking purposefully along the kerb right next to the road! I pulled over and quickly leapt out of the car to see if I could get another photo, but the animal showed a surprising turn of speed as it fled into someone's garden and under a dense bush before I could get close enough for a decent shot. 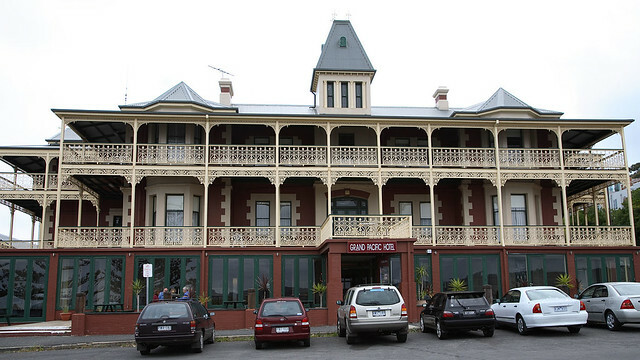 On the way out of Lorne, we stopped briefly for a photo of the picturesque Grand Pacific Hotel, with immaculately painted iron lacework all over its 1880 Pre-Federation balconies and verandahs. I also wandered across the road to look at a large industrial-looking pier extending out into the water, but it turned out to be under renovation and access was blocked. In one of those little towns we were driving slowly along the main road as we saw a huge posse of ducklings being herded across the road by an attentive pair of adults. They were right on our edge of the road, so I pulled over and stopped until they had cleared the road more fully, at which point the mother ducks sat down and waited. I was wondering what they were doing, when we spotted a straggler duckling appear from the other side of the road and waddle across, displaying a slight limp as he followed his faster siblings. We figured the mothers had deliberately crossed the road and then waited for this guy to catch up before continuing on to whatever pond they had in mind as their final destination. Safely caught up to the group, the straggler joined them as they continued their purposeful march. With a clear road once again, we continued on our way. Along the way we had a few drops of rain spatter the windscreen. Michelle asked if the car's wipers were controlled in the same way as our car, and I said yes. Then she said, "How is that? I can't remember how ours works, it hasn't rained for so long." We reached Apollo Bay around 18:40 and cruised through town in search of a motel. We picked a Best Western just along a side street off the main drag, and checked into a comfortable but fairly mundane room. The motel pool looked a bit green and very cold. We decided to go get dinner straight away, since we wanted an early night. We passed an IGA and decided to duck in to buy some breakfast cereal and milk for the morning, before it closed in 20 minutes. We grabbed some muesli, wheat and bran cereal (67% wheat, 12% bran), skim milk, plastic bowls and spoons, and a roll of tape to seal up the cereal bags for travel in the car. I ran them back to the motel while Michelle waited and then we continued our quest for sustenance. We wandered around the main street and settled on a cheap and cheerful Thai and Vietnamese takeaway on a side street, named Bé Bhẽp. The chef took our order of a vege fried rice and red curry chicken and then went to cook them up over a flaming wok in a gleaming steel kitchen right behind the counter. A couple of minutes later he presented us with our containers of food, and we retired to an adjoining room containing a couple of bare tables to sit down and eat. The red curry was quite hot, and absolutely delicious. I don't know if it was just the hot meal after a chilly and busy day, or simply that it was truly the best red curry I've ever tasted. It was truly wondrous. After eating, I complimented the chef on his cooking, then asked if he would mind me taking a photo or two of him as he cooked up the next customer's meal. He was a bit bemused, but said sure, if I wanted to. 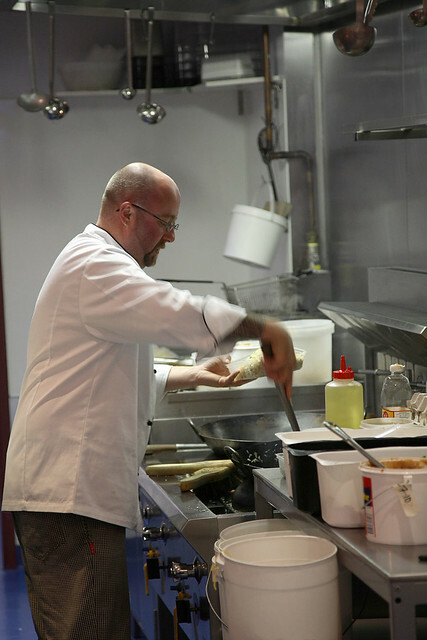 I took a few snaps of him at work over the wok, with steam billowing up into the air. Then I collected Michelle and as we left I gave the assistant one of my moo Flickr cards, and said the chef could e-mail me for a copy of the photo if he wanted. He said thanks and we waved bye as we left for our motel. Ensconced in our warm room, we downloaded the day's photos on to the laptop and gave them a quick run through, then I worked on this diary while Michelle surfed the TV for a while and dropped off to sleep. Last updated: Saturday, 26 January, 2019; 15:03:24 PST.